Whether you live in San Francisco or are visiting, the best way you can spend Saturday morning is shopping at the Ferry Plaza Farmers Market. It will always lift your spirits even on a drizzly day. There is always something interesting to learn from the farmers and always something interesting to cook. 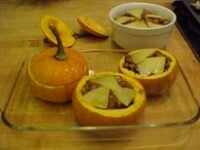 A couple of years ago, I published two easy recipes for this website — Sweet Red Peppers stuffed with Tomatoes; and Baby Pumpkins stuffed with Mascarpone. 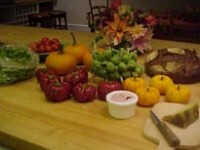 And, here are two more recipes I made with autumn produce from the Farmers Market. Sweet Red Peppers stuffed with Fromage Blanc and Herbs; and Baby Bear Pumpkins filled with Ribolita (a Cranberry Bean Soup layered with Levain Bread and cheese). Place the beans in a large heavy saucepan. Add the garlic and parsley and cover with plenty of cold water. 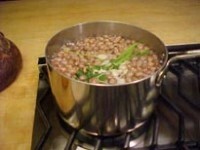 Bring to a boil over medium-high heat and simmer for as long as it takes to soften the beans, 45 minutes or more. Meanwhile, cut the tops off the pumpkins and remove the fiber and seeds. Sprinkle the pumpkins with salt and pepper. Lightly toast the bread, and slice the cheese. When the beans are tender but not mushy, drain them. In a large frying pan, cook the onions in the olive oil for 3 minutes, until soft. Add the garlic and cook another minutes. Add the tomatoes, parsley, and half the chicken stock and continue cooking 5 more minutes. Taste the bean mixture and add salt and pepper to taste. 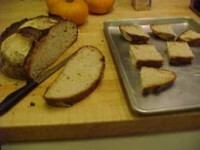 Layer the bean mixture with bread slices in the pumpkins adding enough stock just to moisten the bread. Cover with cheese. 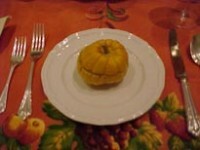 Bake in a 350 degree oven for about 1 hour, until the pumpkin is tender when pierced with a fork.